It's difficult enough for a teenager to navigate life while undergoing cancer treatment, but for 13-year-old Aidan, it means also doing so with limited eye sight. Just after Aidan turned 12, he was told he had a tumor. The following year was filled with numerous MRIs, CT scans, eye exams and two surgeries. The tumor caused Aidan to lose sight in his left eye, as his eyelid can't open anymore due to the size of the tumor and nerve and muscle damage. Over the next two years, Aidan will need to be monitored closely through regular hospital visits and MRIs for a recurrence since the tumor is more likely to return. "This has been a really tough year for him," said Aidan's mother, Sammie. "He is on pins and needles just waiting to see what may happen." 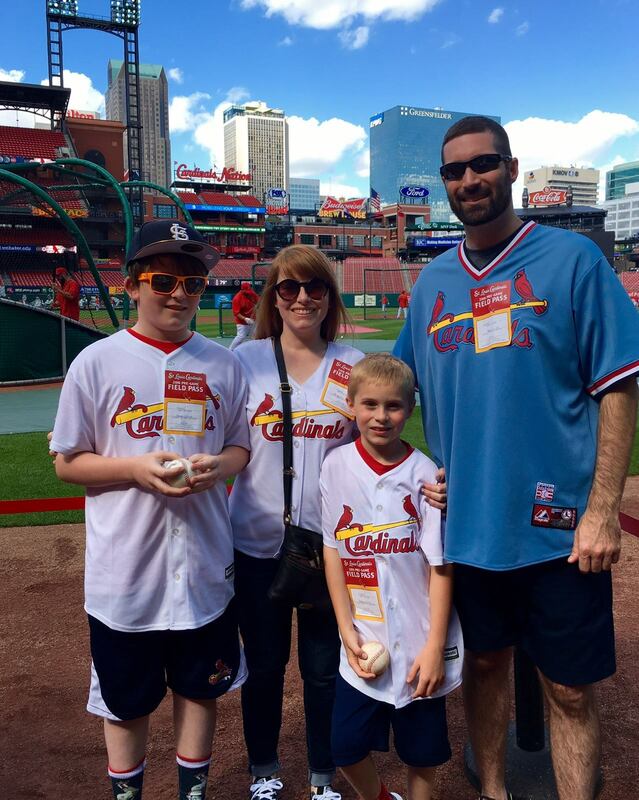 The St. Louis Cardinals generously donated a fan package to Friends of Kids with Cancer's 18th Annual Golf Tournament and Auction this past May. The package included four infield box seats, pregame field visit, professional group photo, pregame ceremony, honorary first pitch and dinner for four in the Cardinals Club. Longtime 'Friends' supporter, Joe Oglesby, purchased the Cardinals package in the auction and graciously donated it back to 'Friends' so that a patient family could enjoy a special family outing. Aidan's birthday fell on a Sunday and 'Friends' Executive Director, Judy Ciapciak, knew that he deserved a sweet 13th birthday, complete with an iPad through Jake's Crew iPad Fund. Jake's Crew was founded by a patient, Jake, who saw the need to give teenagers an iPad to keep up with homework and friends while in treatment. Sadly, Jake lost his battle with cancer before he got to see his idea come to life. Jake's Crew will present its 100th iPad this month. "Aidan had a wonderful time and was very surprised and overwhelmed by the generosity and support of Friends of Kids with Cancer and Jake's Crew," said Sammie. "He was humbled by Jake's story and it meant a lot to him that Friends and Jake's family wanted to give him an iPad. 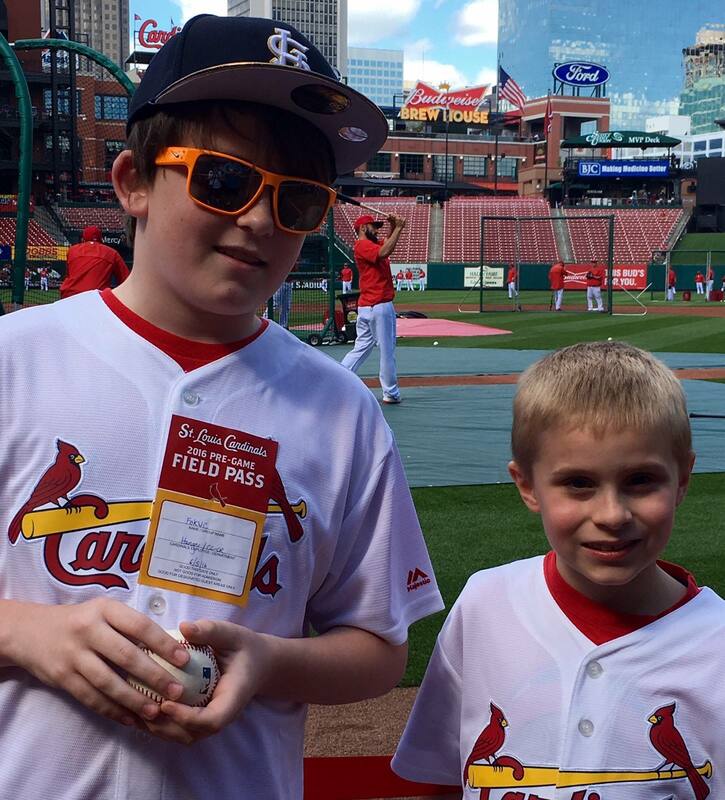 That alone would have been enough to make his day, but the surprise from the generous donor and the Cardinals just made his 13th birthday even sweeter!" 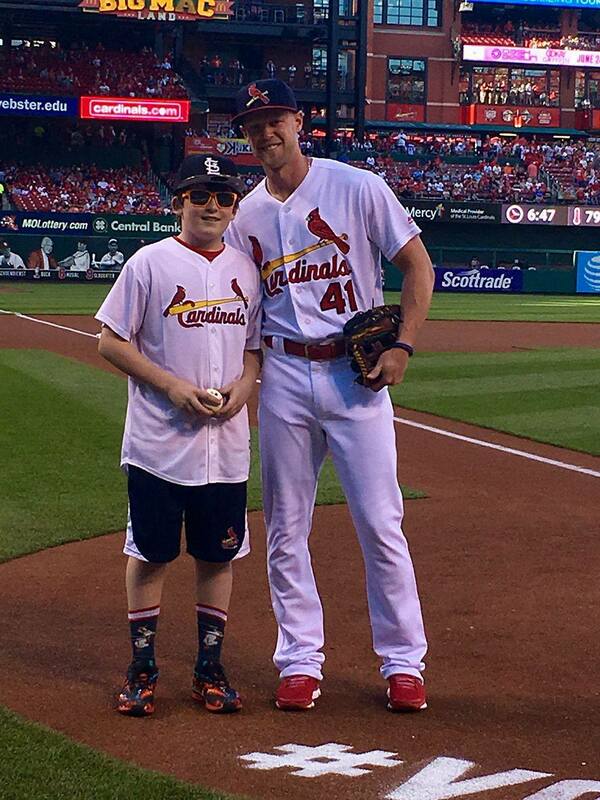 Aidan was thrilled not only to receive a new iPad, but he got to throw out the first pitch, meet Jeremy Hazelbaker, get his photo taken and his name was displayed on the jumbotron for everyone to see. A well deserved 13th birthday for a kid who has been through so much this past year. "I was hoping that the surprises he received on his birthday would help him to see that good things will happen to him and I wanted him to take this experience as a sign that 13 is going to be a better year for him," said Sammie. "When I asked Aidan what he thought about his birthday and the gifts and experiences he was blessed with, he said he felt special, really happy and like he can have or do anything he wants in life. He said he has a fresh start to the new year!"